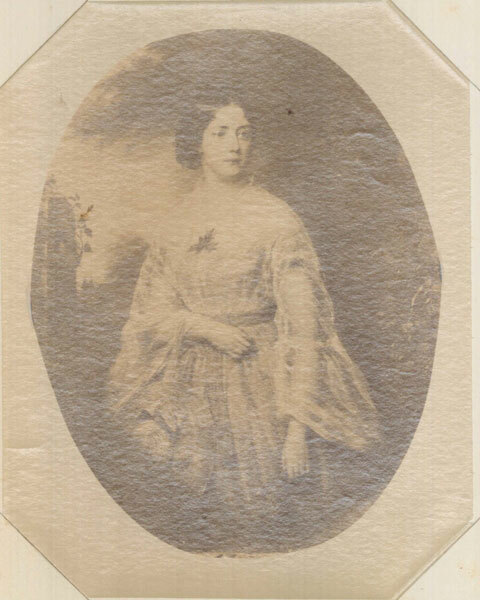 The Armstrong Browning Library owns a small album of manuscripts, letters, and printed items that contains memorials to Annie Howard, daughter of Susan and John Tasker Howard. Annie died unexpectedly in Milan on 6 June 6 1860. The Howards, Harriet Beecher Stowe, and the Brownings had shared acquaintances in Italy during that period. The tributes in the album were written by three well-known nineteenth-century figures—the anti-slavery preacher, Henry Ward Beecher, his novelist sister, Harriet Beecher Stowe, and poet Elizabeth Barret Browning. 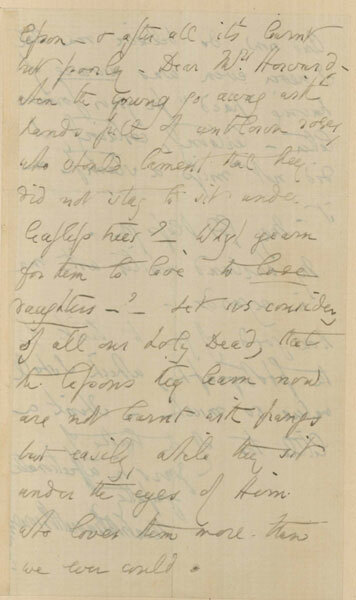 The album contains two letters from Elizabeth Barrett Browning to Annie’s mother Susan and a copy of Barrett Browning’s “De Profundis,” written twenty years earlier following the drowning death of her dear brother, Edward. Stowe contributed a poem commemorating Annie to the album and a copy of Henry Ward Beecher’s funeral sermon was also included in the memorial album. Harriet Beecher Stowe. “To the Memory of Annie, who died at Milan June 6. 1860.” In the Annie Howard Memorial Album. 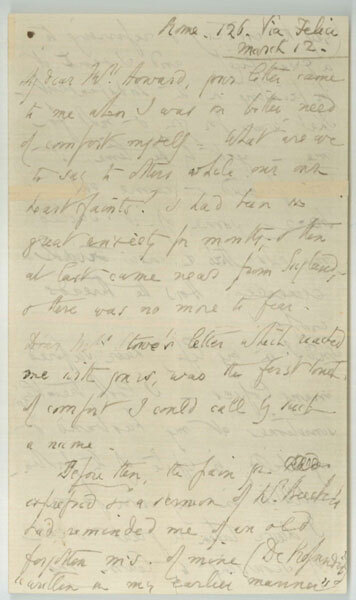 Autograph Manuscript. . 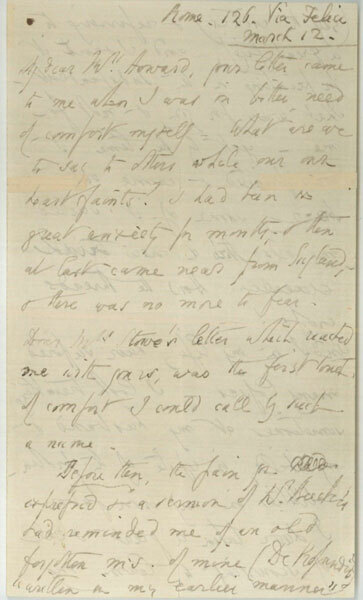 The two letters from Elizabeth Barrett Browning are beautiful expressions of condolences on the death of Annie. 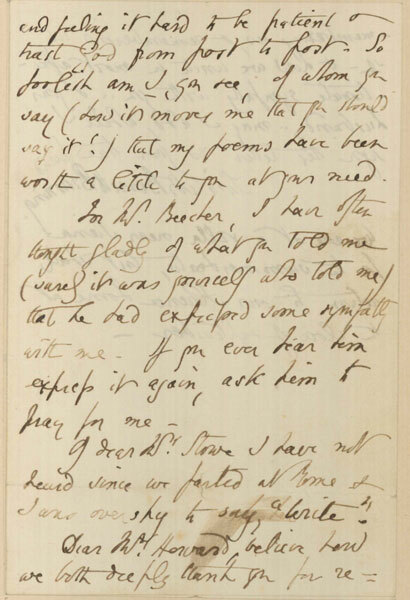 Letter from Elizabeth Barrett Browning to Susan Howard. 14 August . I receive your letter, read it, hold it in my hands, with a sympathy deeply moved. . . . Hearing of such things makes us silent before God. What must it be to experience them?—I have suffered myself very heavy afflictions, but the affliction of the mother I have not suffered, & I shut my eyes to the image of it—. 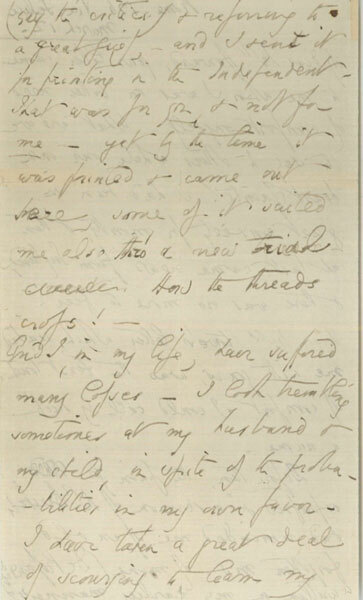 Letter from Elizabeth Barrett Browning to Susan Howard. 12 March . 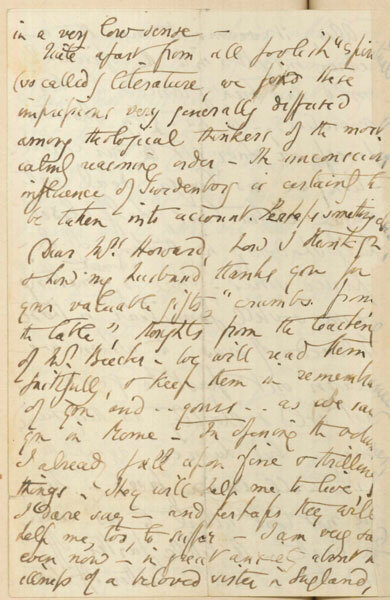 My dear Mrs Howard, your letter came to me when I was in bitter need of comfort myself—What are we to say to others while our own heart faints? I had been in great anxiety for months, —& then at last came news from England, —& there was no more to fear. . . .
. . . Dear Mrs Howard—when the young go away with hands full of unblown roses, who should lament that they did not stay to sit under leafless trees? —Why yearn for them to live to lose daughters?-Let us consider, of all our holy Dead, that the lessons they learn now are not learnt with pangs but easily, while they sit under the eyes of Him who loves them more than we ever could. . . .
daughter of Susan and John Tasker Howard. 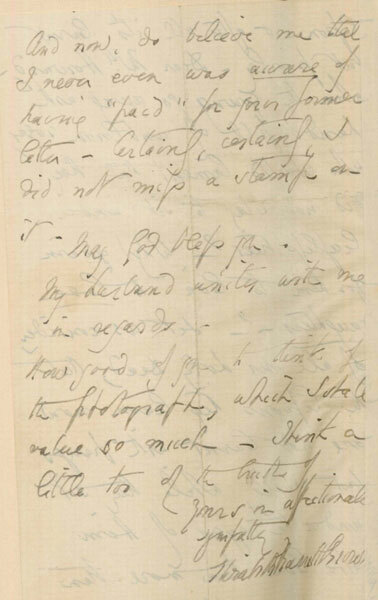 This entry was posted in ...from America: The Brownings' American Correspondents, Exhibitions and tagged Annie Howard, Armstrong Browning Library, Elizabeth Barrett Browning, Harriet Beecher Stowe, Henry Ward Beecher, Italy, Robert Browning, Susan Howard by melindacreech. Bookmark the permalink.